What would you recommend for a fresh new atheist to read / watch / learn / do? I am actually seeking advice. I was an evangelical Christian for over 13 years and the only resources I consumed were the Bible, evangelical Christian books, Creationist "science" and a few secular books about self-help, finances, and non-religious related. I feel a huge gap in my knowledge and I don't know where to start with. Should I learn the basics of evolution, logic, science method, etc ? This year, I finished reading Homo Sapiens by Yuval Noah Harari. I found it really interesting. Sometimes I feel lost when I listen to Christian Apologetics arguments. I have the feeling that there's something wrong, but I can't detect it immediately and very often it requires a lot of research from me. e.g. Sye Ten Bruggencate arguments and his usage of presuppositionalism. Also, I am interested in the history of Christianity, how this religion was formed, how the Bible was made. I finished reading the book Misquoting Jesus by Bart Erhman and I was stunned by how the New Testament was formed. They never told me about it from the pulpit. I bet a lot of pastors don't even know it. Sam Harris YouTube "Letter to a Christian Nation"
Get Books cheap at Thriftbooks.com When you find a book, look for it used for significantly reduced prices. Matt Dillahaunty has a project where he goes over them all one by one. COSMOLOGY - origin of the universe. ORIGIN OF LIFE IS NOT COSMOLOGY AND MAY NOT BE BIOLOGY. EVOLUTION: This is what takes place after the first living things emerge. NOTHING IN THE ABOVE HAVE ANYTHING AT ALL TO DO WITH ATHEISM, Atheism is a lack of belief in God or gods. Here is a list I listen to regularly. I have always loved Aron Ra. He's great. His series "How Aron Ra Disproves Noah's flood", "Refuting the Irrefutable Proof of God", "Foundational Falsehoods of Creationism" are definitely recommended viewing. Viced Rhino This is second guy I found and he is also the best. Paulogia A former Christian takes a look at his former beliefs. He also does the Ham and AiGs News. Godless Cranium This is the first guy I found and I still rank the best. Suris A gamer who also happens to be atheist. Rationality Rules Australian and very good. DarkMatter2525 The best and rudest debunker of any religion. Genetically Modified Skeptic A former Jehovah Witness. His main focus is debunking alternative medicine. Professor Stick This dude is just great. Prophet of Zod This guy is a former Christian school teacher. Thunderf00t I just like this guy's work. Especially his "Why do people laugh at creationists?". Although there are 48 videos, well worth the watch. TheThinkingAtheist Seth Andrews. A former radio announcer for some Christian association for over 25 years. Holy Koolaid This guy was recommended to me by someone else. Very good content. CosmicSkeptic This guy may not post as often as he did (he is studying for his doctorate), but he has some excellent content. Shannon Q This lady is quite intelligent. She was the driving force behind Paulogia, Godless Cranium, and Viced Rhino. She did their research behind the scenes until they convinced her (and her fans) to create her own channel. She has a degree in something psychiatry and is a social advocate worker. 43alley Although I haven't seen a new video in quite a while, what he has posted is still worth watching. During my deconversation, I came across mostly of these resources. I enjoy watching Matt Dillahaunty, Atheist Experience, Aaron Rah, Sam Harris, and Talk Heathen. I also learned early that atheism has nothing to do with evolution. Many Christian and other religious people accept evolution as a fact. Although, when I was a Christian I had all those misconceptions about atheism, evolution, cosmology, etc. The first time I heard about those things was from people in the pulpit that knew nothing about evolution. "Science says: man descended from monkeys" they said. I had a similar experience when I was Christian too! I also used to think that atheism = immorality, secularism = persecution of Christians, abortion = murder, Santa Claus = war in Christmas (no really, I did), and that the answer to how the universe started and how evolution started were “Goddidit” and “Goddidit”, respectively. The anti-choice thing was the first to go; after my mom explained the ugly truth behind the whole “(sic) Pro-Life” crusade from a female, less-strawmanned, and (somewhat) feminist perspective, it was one of the things that first shook my faith, as it did my trust in the church. Those are great resource listed in previous posts. But I would also recommend being active in this forum and read all the debates. This has been the greatest source of information and learning for me because we have such a great number of very talented and knowledgeable members here. And don't forget about humor, it's a big part of the whole process. RationalWiki. They have tons and tons of articles on this kind of thing. It’s one of my favorite wikis. Guys, thank you very much for the resources. Here is another thread of resources. Howdy, Oten. Sorry I'm a little late getting here. Welcome to our cozy corner of casually controlled cosmic calamity. Plenty to see and learn here. Since dear ol' Bad Santa mentioned humor, I would like to expand on that a bit. (I'm rather partial to humor myself... *mischievous grin*) Personal opinion here, but being able to laugh at something is a really good way to help get through a difficult situation. That being said, I always suggest people watch a few Non-Stamp Collector videos and the early Dark Matter vids on YouTube. I can tell you from personal experience they were of great help to me as I was going through my transition. They definitely allow you to see religion as the ridiculous nonsense it truly is. Plus, they are very entertaining... *chuckle*.... Enjoy. 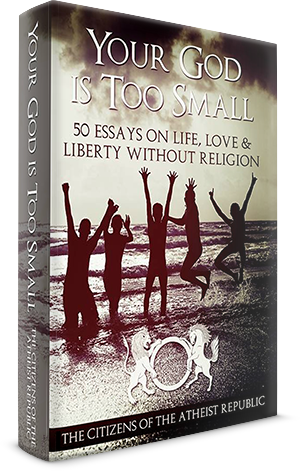 I’ve got another: the “Your God Is Too Small” ebook that you can optionally download for free when you create an account here. A download link will be included in your verification email. It consists of essays written by Armin, Allie, Abbas, and many other Citizens of ARep. If you don’t want to scroll down a PDF on your computer, then you could always print it and turn it into a physical book. Great suggestions here if you have not already seen them. -Operate from: god is a made up fairy tale made by humans, (enormous amounts of evidence for this if you do not want to take my word for it.) Once you always assume and operate anything religious is a lie it is fairly easy to work backwards from their to explain anything religion oriented. Is there an afterlife? -- well the idea sprung from religion/god, there is no god so we can safely dismiss any claims for an afterlife. Is there a purpose to life? 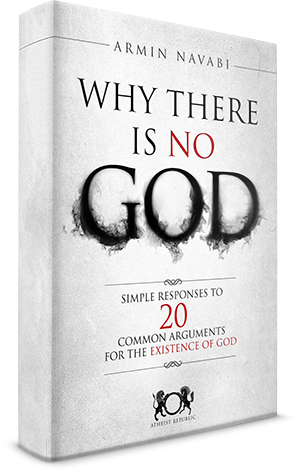 -- well the purpose to life given in religion, well there is no god, so purposes explained there has no real basis, so we can dismiss them unless new evidence from something not god oriented shows a purpose to life. Know that organized religion that accepts any money, enriches or empowers itself in any way is a CON, probably the oldest and most refined con there is. It is a particularly effective con because so many people believe in it and all the believers teach other believers, I would say even most of the religious leaders also believe the con, as the con preceded them, sometimes by 1000 years, and the con learned to protect it self with 1000's of years of practice. Happily with the internet and continuing spread of knowledge, the religious lie con is rapidly meeting its end. The lies and deceit increasingly no longer work in the face of real knowledge. While some people may hold ever tighter to their beliefs, the presence of the internet, the spread of highly accessible knowledge based on fact is shining light banishing shadows and deceit like religion ever so slowly. The latest generation of people born after the turn of the millenium have never been more secular, and this even accounts for some of the religions that are expanding today, (like Islam.) I do not expect old people to very often turn their backs on religion they have practiced all their lives, but the younger generation that can google "is there a god" at any time of the day and get answers immediately are seeing the lies in a much more accessible way then ever before.